Can you believe it – it’s middle of July already! Here in London we have had amazing weather for a very long time, actually since it stopped raining in March, although it was rather cold in March and April. But since May we have had summer basically, and not many days below 20 degrees and many days hovering around 30 degrees C. The last week we have had some welcome torrential rain, but although it has been good for the flower beds, all the pots and containers still need watering almost every day. I am glad I have managed to reduce the 350 or so pots down to a more manageable 200 plus! 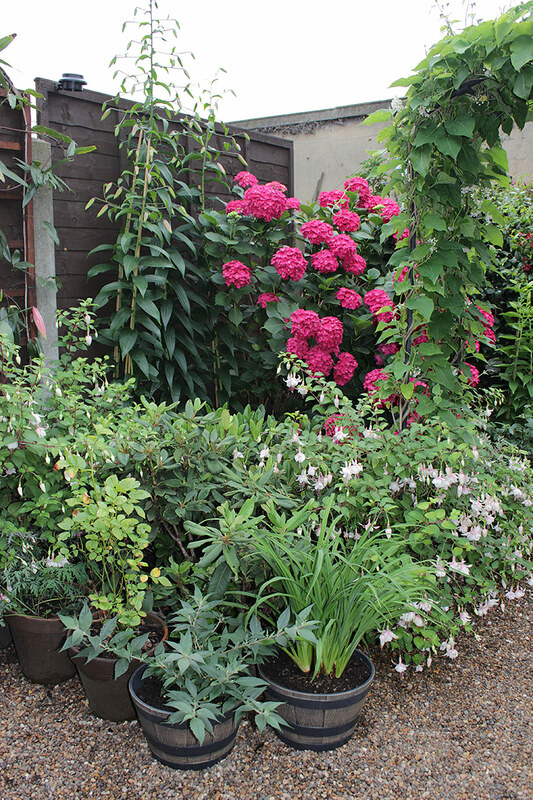 It’s Garden Bloggers’ Bloom Day again, grab a cup of your favourite brew and come with me on a guided tour into my London jungle garden, I’ll show you what’s been happening since last time you were here. Lets’ start in the front garden. 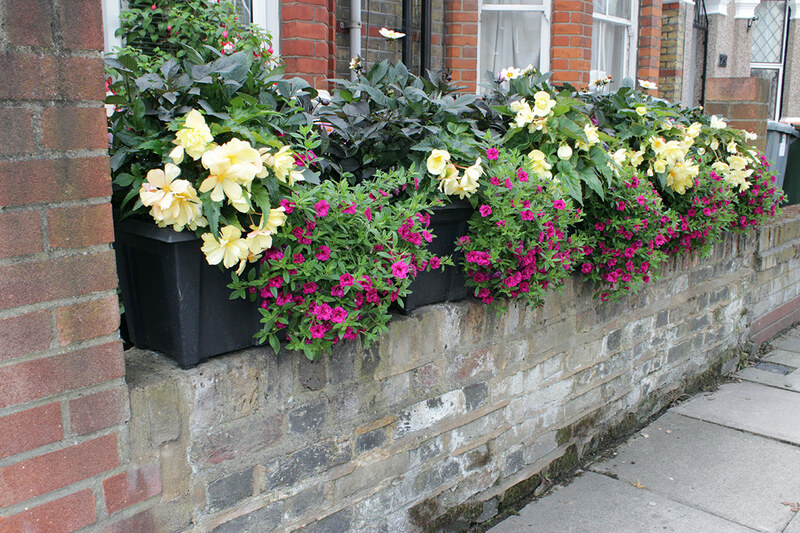 Here are my summer window boxes, starting to plump up, with creamy-yellow trailing begonias, strikingly pink Calibrachoa and 3 types of dark-leaved bedding dahlias in each box. The dahlias have been a bit of a disappointment so far, the flowers are mainly below the leaf level so most of them are hidden amongst the leaves instead of towering above them like all my other dahlias. Not sure if this is a ‘design fault’ or if they will stretch up when we get further towards autumn. The flowers are cream, pink and dusty pink, would have been nice to see them properly. OK, now to the back garden, i.e. the jungle! 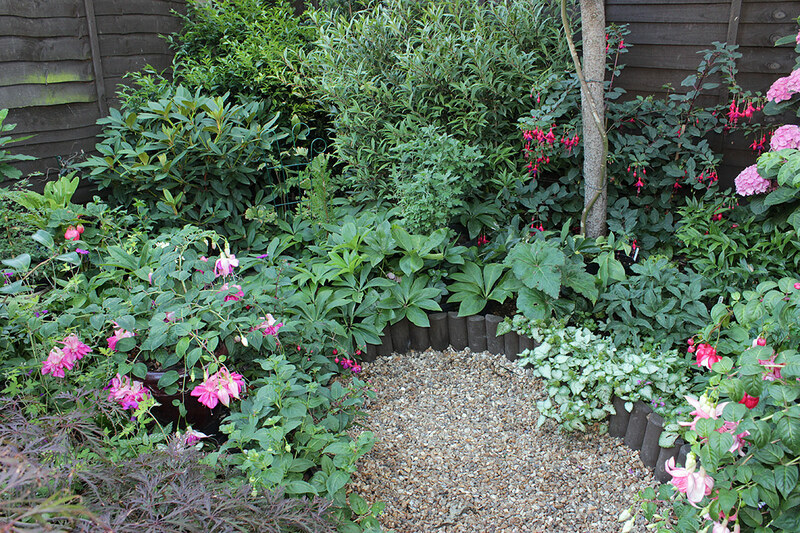 Can’t believe we are just in July, the garden is going to grow for another 3 months and it is already looking like this! In the bed next to the patio, the most striking feature is all the daylilies which has flowered for over a month now, and above them the sunflowers are towering, in the same burnt red colours. 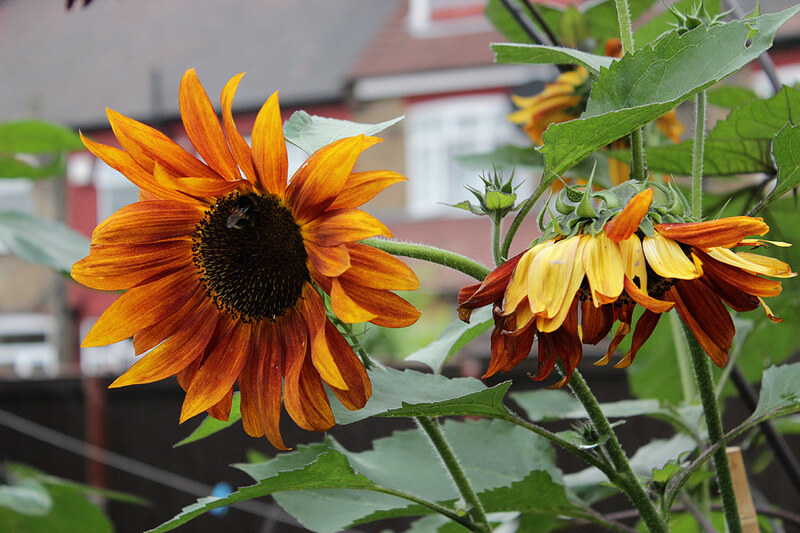 I can’t believe I have managed to grow monster sunflowers this year too, these were supposed to grow to 4 ft! 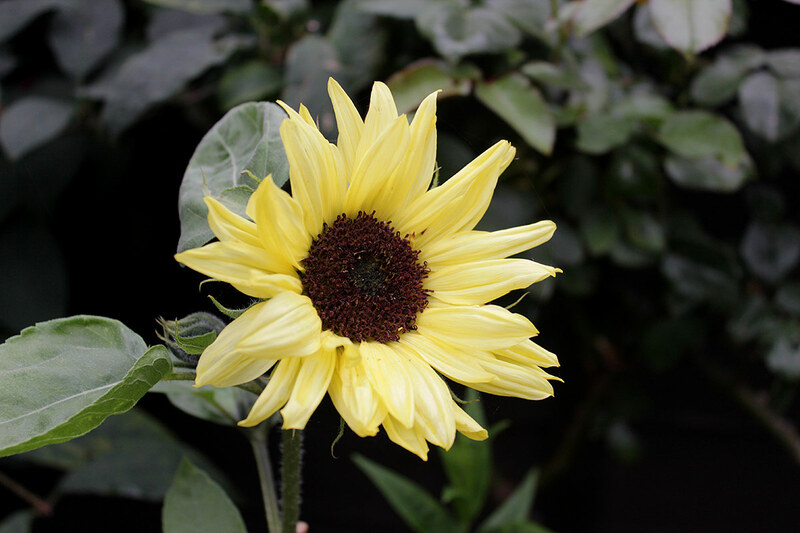 ....this is how they all 4 were meant to be, Helianthus 'Claret'. 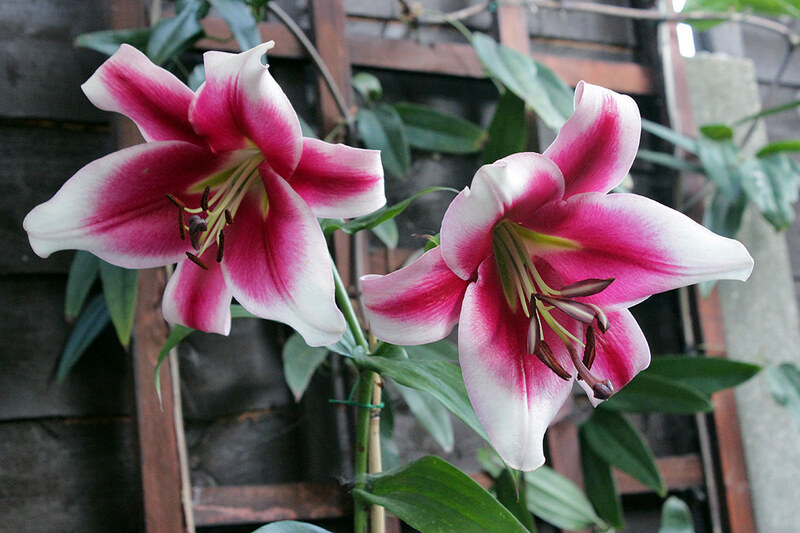 Speaking of monsters, my new Goliath lilies have been flowering for a while, these are in their first year and in year 3 and onwards they can become more than 2.5m tall. 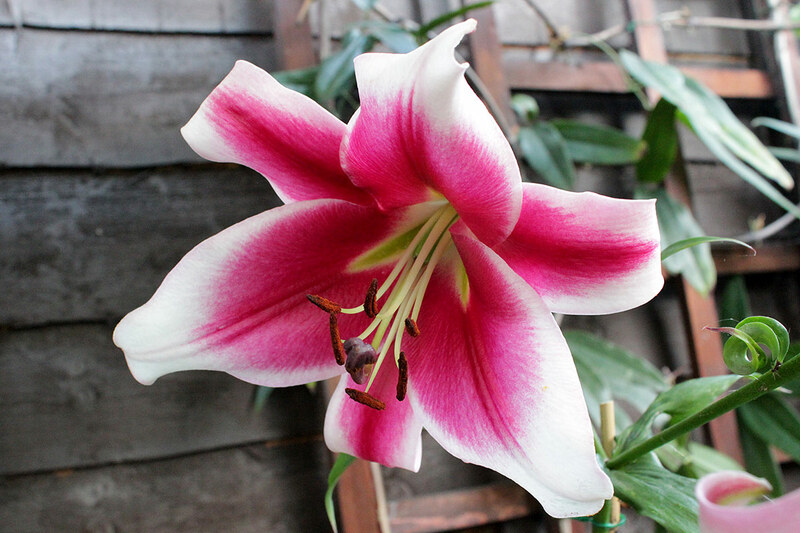 This is Lilium 'Friso', a lovely scented giant and the flowers last for weeks! I can smell these lilies stand several metres away from them, they are just intoxicating and to me there is no better scent in the garden than oriental lilies. 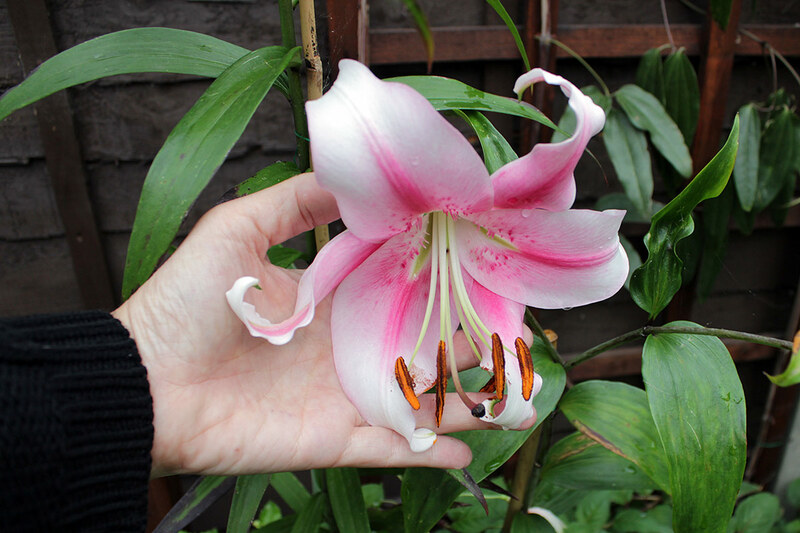 Here is another giant Goliath lily, this one is called 'Anastasia’ and is also just in its first year. I have a third Goliath lily which will flower next month, it is now much taller than my 2m tall fence, and is in its third year, called Miss Feya – hope to show it next GBBD. And now to something completely different – clematises! Well, let me begin with the beginning. 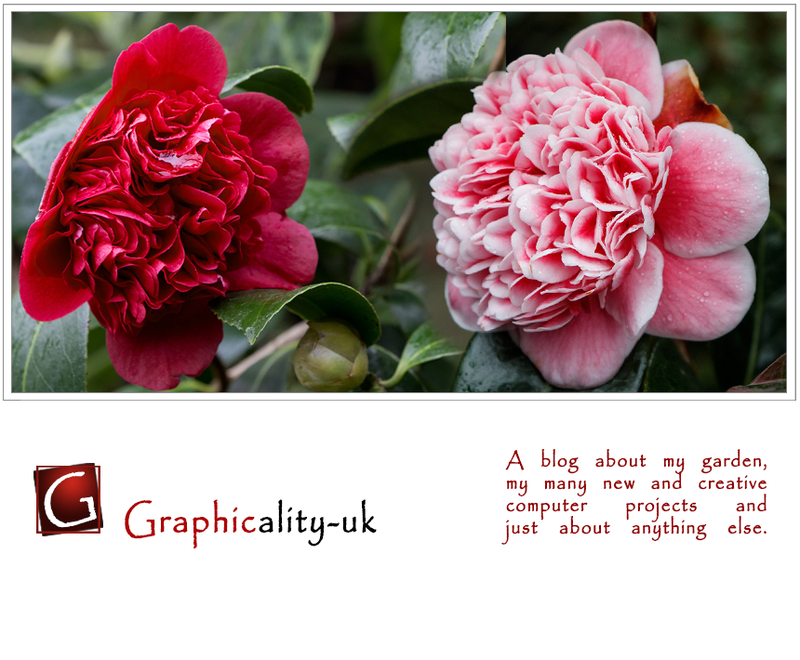 This is a photo from GBBD in March, when my camellia had just started to flower. 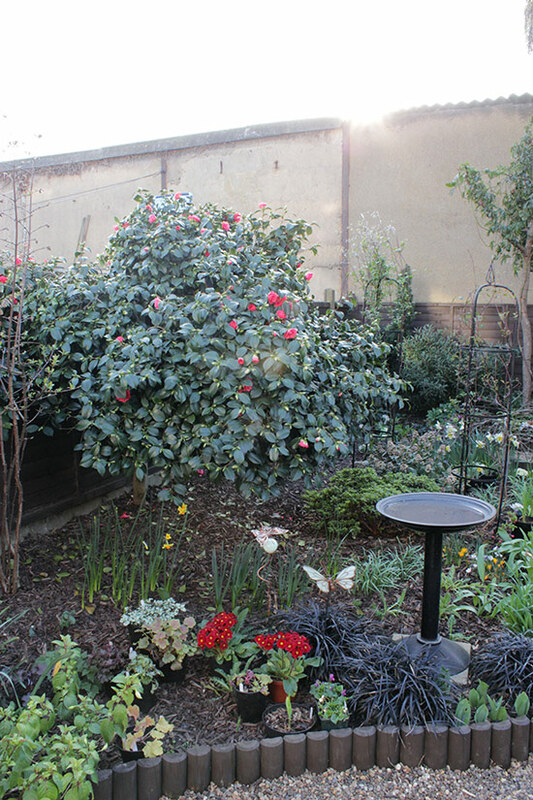 Can you see those two obelisks behind and to the right of the camellia? 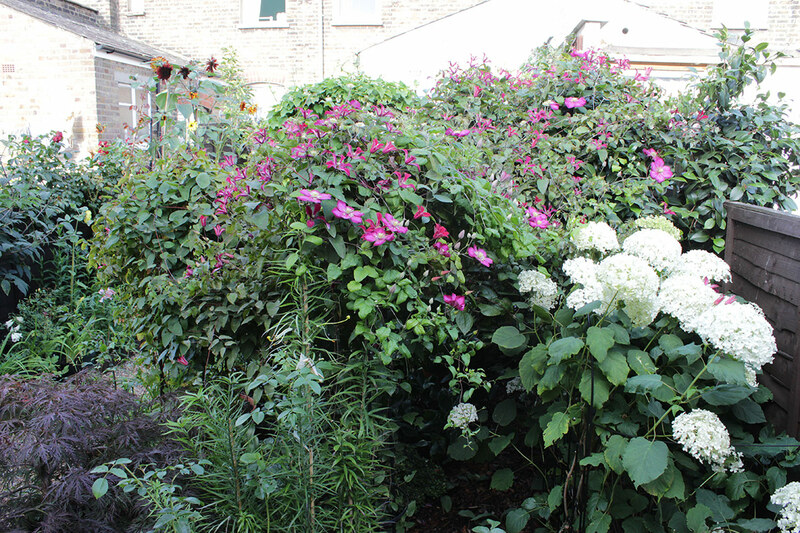 That’s where my two old, mature clematises grow, Clematis texensis 'Gravetye Beauty' to the right and what I have always thought (and according to the label) was Clematis 'Niobe', but lately have come to doubdt when seeing photos on blogs here. Whatever she is called – oh yes, she is a ‘she’, she is a beautiful clematis, if anyone has a name for her please put it in your comment. So, anyway, usually the clematises grow up the obelisks and fold outwards a bit, often end up tangled and entwined, but that’s OK, they are cut down to the ground next spring anyway. Mainly flowering in the big old camellia, covering the whole thing in flowers! You really can’t see where the two obelisks are, and where the obelisks ends and the camellia begins – it’s all a huge mound of clematis leaves and flowers! Deadheading is impossible, I have always used to snip off spent flowers but not this year. Still, they keep on flowering. Here they are, both of them. And this photo is from the left side of the camellia, where most of the 'Gravetye Beauty' flowers. The colour of this one is rather beautiful, even if it was meant to be Niobe, and even if I think Niobe looks even more beautiful in photos. I can see I need to make room for one more clematis....somewhere! OK, so from one (or two) monster plants to the next one, this is my passionflower, Passiflora caerulea draped over a dead tree stump. I gave it a really good snip in March, cut off more than 60-70% or so, but it has already grown bigger than it was last year at the end of autumn. The flowers are spectacular and it is already producing fruit. The fruit will be orange when ripe. The flowers look so intricate, I never tire of looking at them. And now to something completely different, but still rather alien – my summer flowering hellebore. If you are a regular visitor here you will have seen this one before, as it flowers every summer. 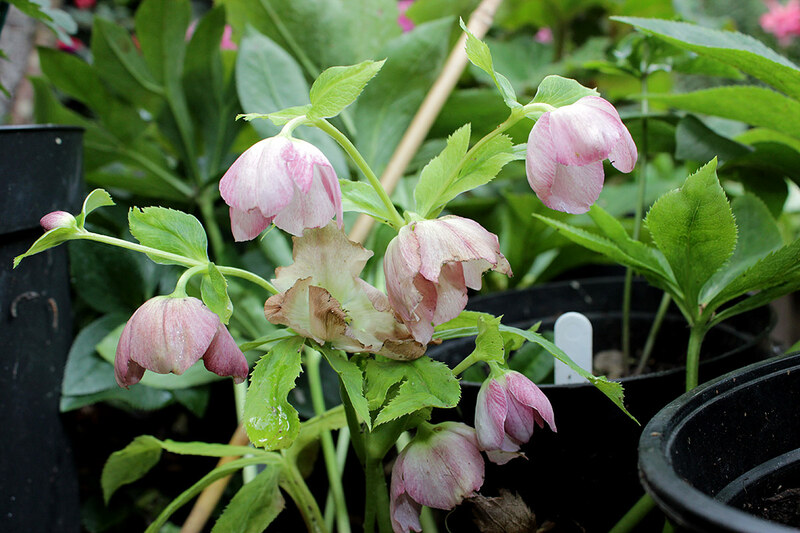 This is the only pink hellebore I have, so the only time of the year I get to see a pink hellebore in my garden is in July/August, it doesn’t flower in the winter with the rest of the hellebores! 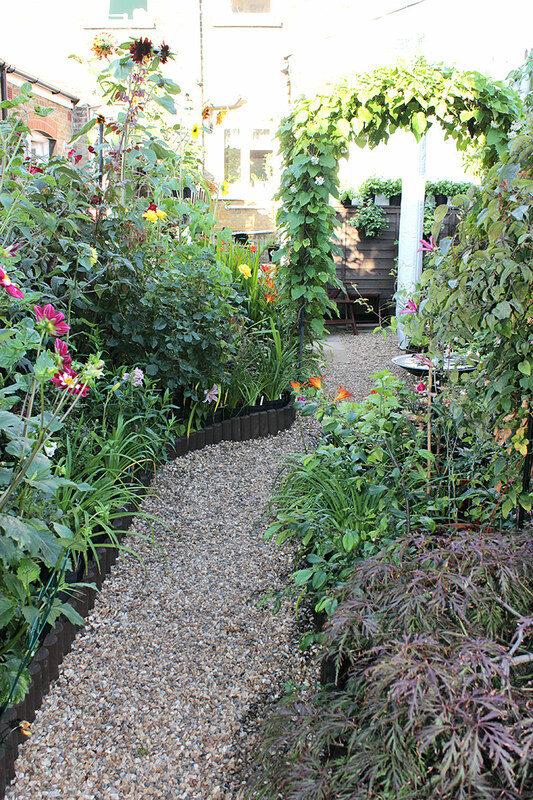 Here is a view towards the bottom of my garden, the beds are so filled that it is difficult to walk on the path without bumping into flowers on both sides. Down here in this corner there are lots of fuchsias that don’t really appreciate sun, they love the shady, damp contidions down here. And walking a bit further up you can see the whole dahlia bed in full. Some of them hasn’t come into flower yet, I am still waiting for 2 different new ones to flower, but the rest has been flowering since last GBBD. 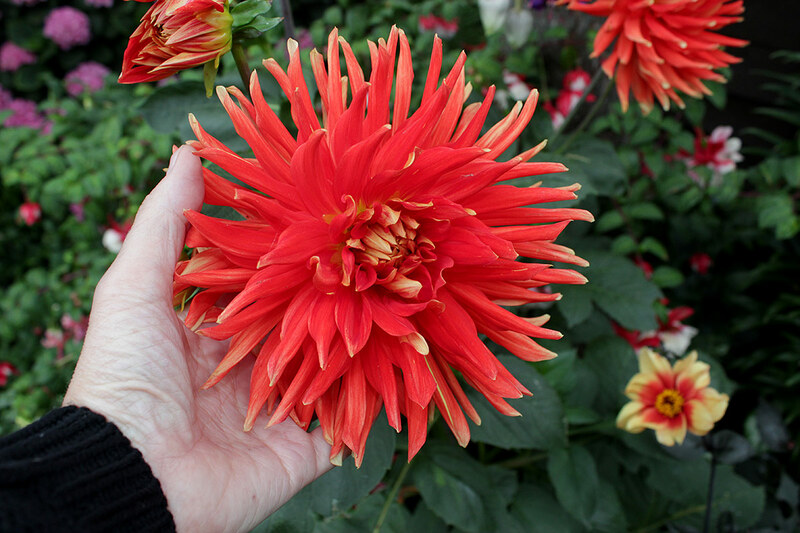 Look at the size of Dahlia 'Striped Vulcan' ! 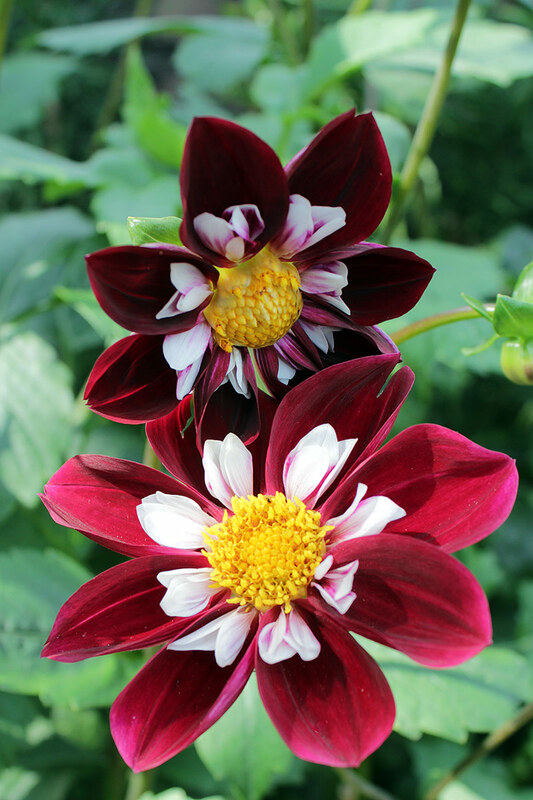 I think Dahlia 'Mary Eveline' is my favourite dahlia. If we walk further along this bed we get to the last roses of the first flush – it lasted a long time this year, but the last couple of weeks with heavy bursts of showers now and then and soaring temperatures has taken its toll on all the roses. Now it’s going to be a quiet period for the roses, with just the odd rose here and there, before they put on another flush again in August. The rose ‘Crimson Cascade’ is my oldest rose, and also one of my favourite. Here together with ‘Freedom’. My two hydrangeas are growing like mad, this one is in serious need of staking – something that should not be necessary for a hydrangea. 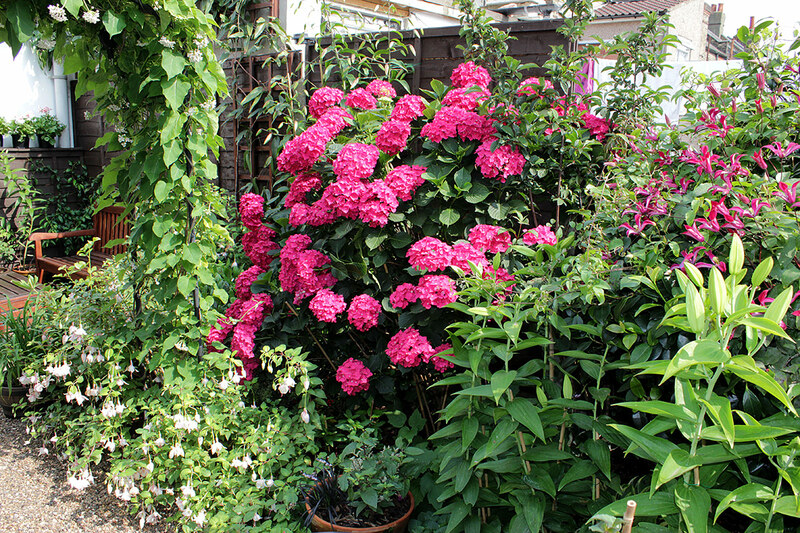 I think I need to prune harder every winter, I just do the obligatory down to second fat bud, with such mature bush and such a speedy growth I need to prune more because my hydrangea can’t take the weight of these flower heads on the tall branches. It has already got lots of bent, hanging branches just supported with a web of bamboo – not really supposed to be necessary! This hydrangea is a bit easier to manage, not as tall, and a good few years younger, from memory I think this one is 6 or 7 years, the other one is 10. 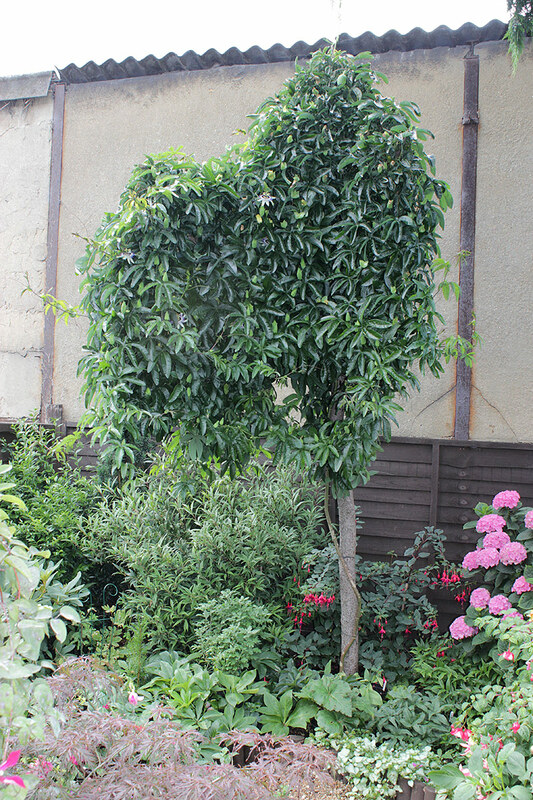 But it is growing taller and wider every year, I can see I need to do some serious pruning here too soon. One could get the impression that my garden is just filled with tall, monster plants with huge flowers – that’s not the case. Here are some rather understated flowers you will have to bend down to really appreciate. 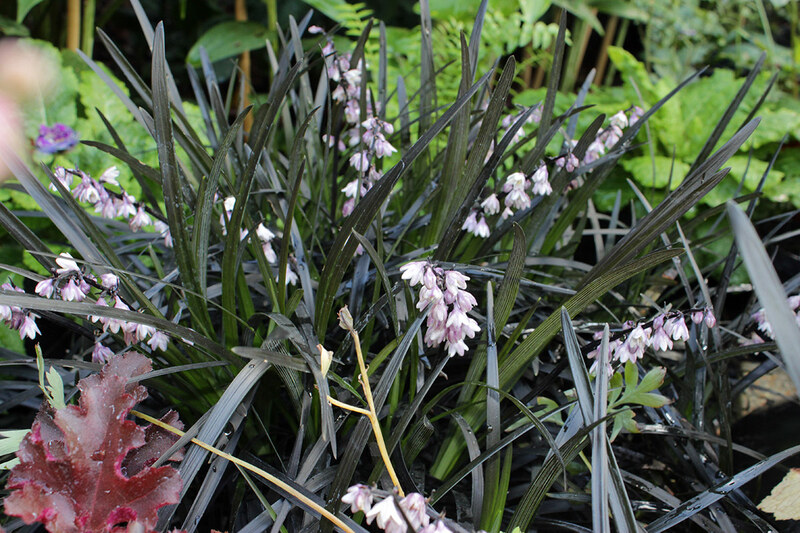 This is the flowers of Ophiopogon planiscapus 'Nigrescens' or black mondo grass as some call it, or black lily grass as it is also called. The flowers are tiny but beautiful, and in a few weeks time the flowers will fall off and black berries will develop. The berries will stay on the plant until the flowers appear again next summer. 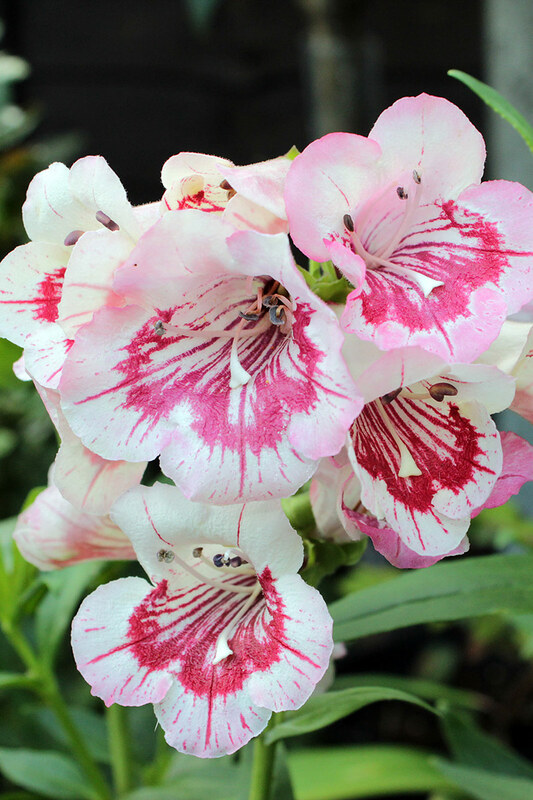 And here are some other cute flowers, this is Penstemon 'Strawberries and Cream', a lovely new addition to my garden. I have already taken cuttings of it! 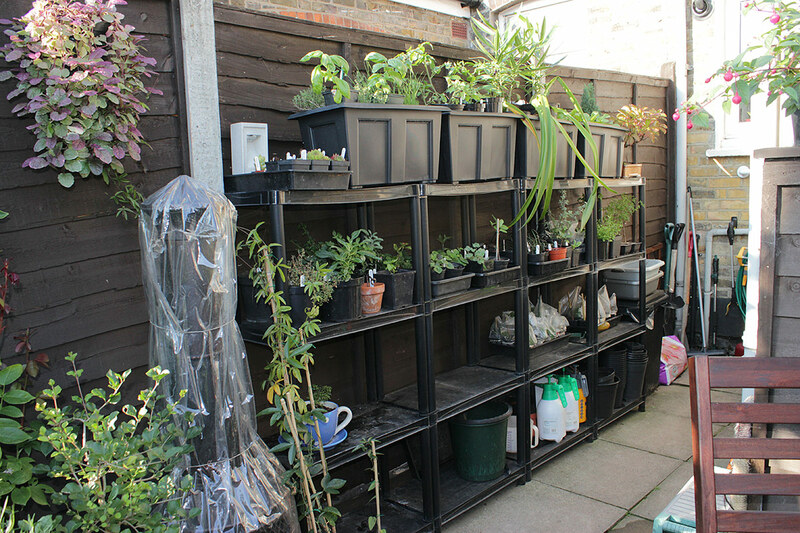 And speaking of cuttings, have a look at my nursery shelves, have you ever seen them as empty as this?! 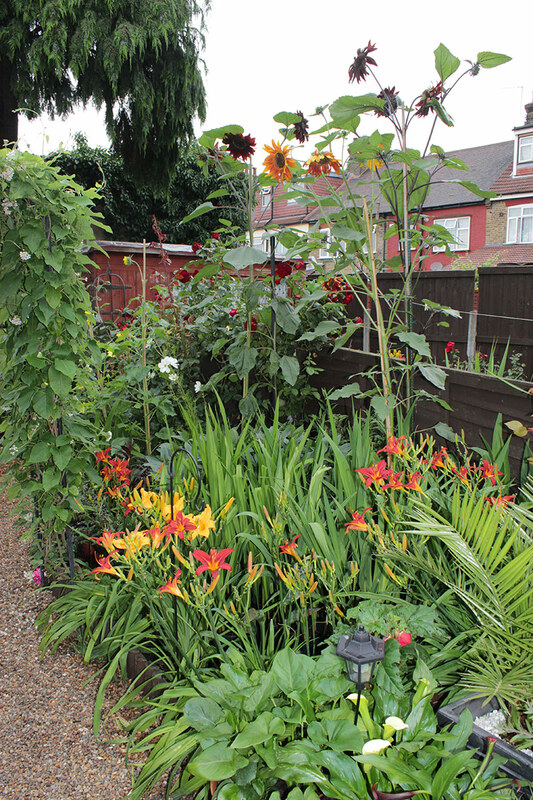 I have managed to plant out a lot, and I have also given away, swapped and sold some plants so there is very few left. It’s mainly on the top shelf I keep plants now, and here is my kitchen garden, plus some sun hungry plants like my two oleanders and a tray of succulents (in the foreground). 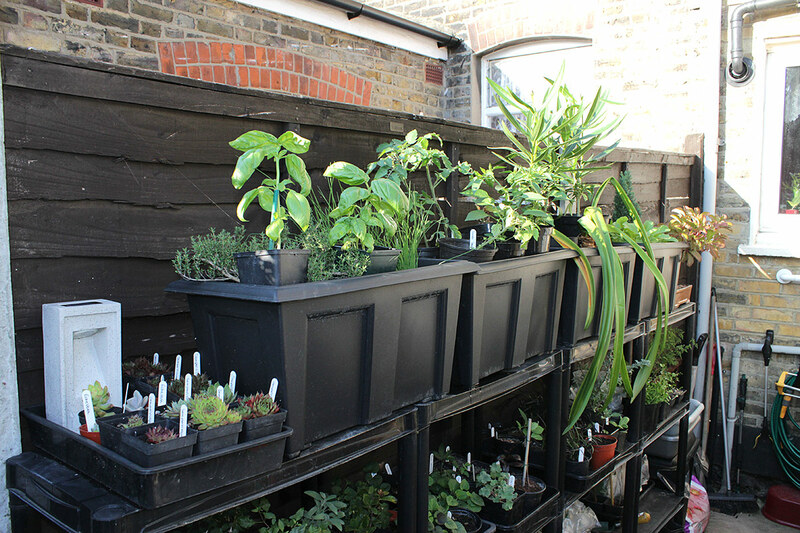 The edibles are radish, chillies and 3 types of tomatoes – but I did not have much luck with sowing tomatoes from seed as my kitchen is too dark really for growing anything from seed. So I decided to buy seedlings online instead. I bought them in April and delivery was supposed to be in May. Guess when I received my tomato seedlings? Last week!! I am furious with the nursery, will never use them again, I hope I will have tomatoes ready before Christmas…and without a greenhouse I need to get them ready before we get too cold weather. The rest of the edibles here are herbs: chive, basil and thyme, all of which I use a lot of all year round. Well, I haven’t mentioned fuchsias in the garden yet, they are of course plentiful! Someone asked me last week how many fuchsias I have, and I had to admit I had absolutely no idea – so I just had to count them. I had 56 all in all. But a couple of days ago I managed to find a good home for 2 more fuchsias, so now I have only 54. However, at the end of this week I will get delivery of 10 new fuchsia cuttings that I have never grown before, 10 new plants that I next year can take cuttings of and make many new fuchsias from. Yippee! This is ‘Annabelle’, a trooper in my garden, I have 4 mature , tall plants and several cuttings from last autumn already flowering. And this is a close-up of Fuchsia 'Velvet Crush', the same as the big fuchsia in my front garden. 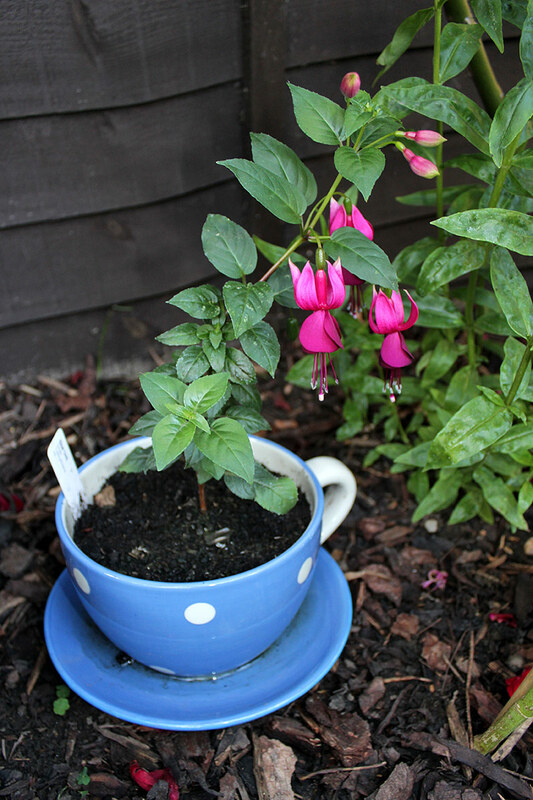 This massive bundle of fuchsias is just one pig pot, but with 3 plants, I should never have planted that many together – they were tiny when I did it! 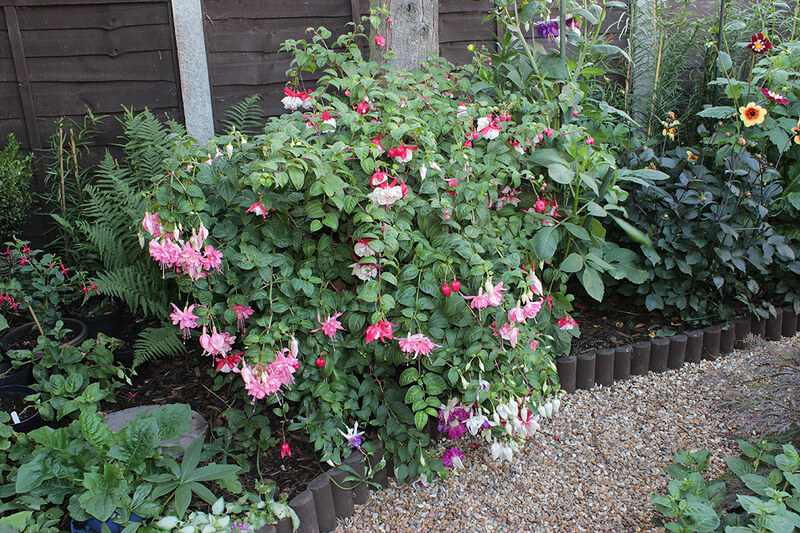 Since then they have grown a bit – a lot, and they have all flowered non-stop since July last year and never had a dormant period during winter, I actually hope there will be a rest for the fuchsias this winter so I can cut them down as usual. Then I can perhaps manage to split this one into 3 plants. As this one stands now it needs watering with copies amounts every single day. And here is a beautiful fuchsia too, this is ‘Bella Rosella’, it probably got the biggest flowers of all my fuchsias. 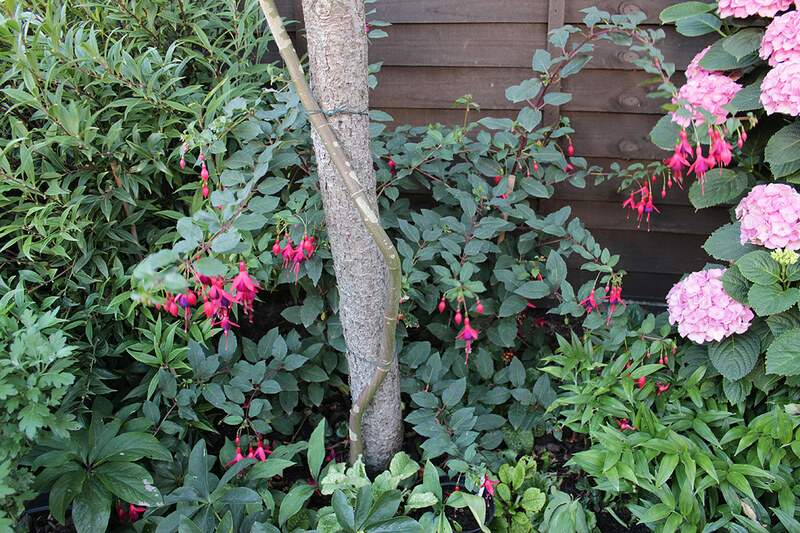 This is ‘Mrs Popple’, a fast growing fuchsia, completely hardy. And this little beauty is Fuchsia 'Blue Veil', rather on the small size still, but it will grow bigger. I haven’t put any close-ups of my many new hemerocallis, I plan to make a separate post with all those that flowered this year when I got time. It will come eventually! I am linking my post to Carol at May Dreams Garden, If you head over to her blog you can see many more gardens in flower around the world right now. Until next time, take care. Wow... amazing! It's really bountiful garden! Speechless... I really love the lilies, dahlias and of course the fuchsia! I love the pathway through your garden. Very pretty! Those those Dahlia's are some I've never seen before. Just beautiful. Glorious Helene, as always. My favourite is still the rose ‘Crimson Cascade’, what a fabulous form and colour. Is it scented? 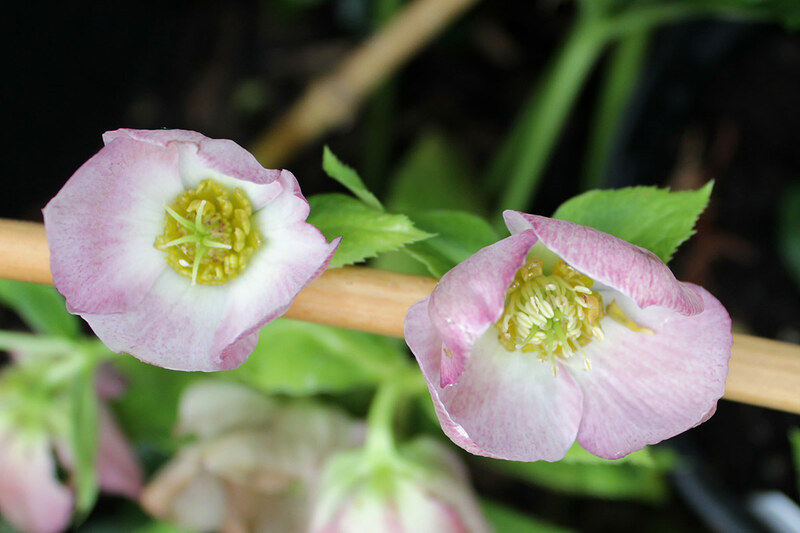 Good luck with the hellebore seeds! Lovely jungle, this is how a garden should be in my opinion, great! Your different sun flowers look gorgeous and you made a fine picture of Crimson Cascade, beautiful velvet. 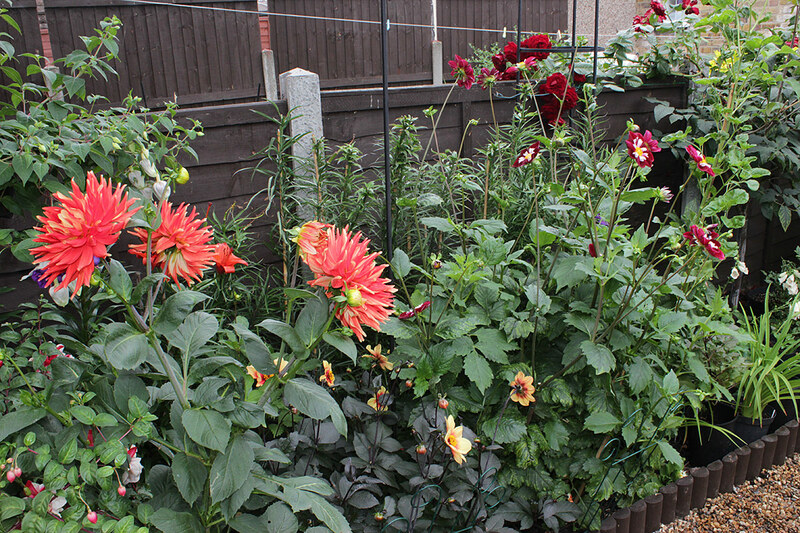 Your windowboxes in the frontgarden are amazing too, I think the Dahlias will grow higher later. Thanks Janneke, my jungle is just about manageable, more plants than this and I could not take care of them, it’s a lot of deadheading right now! 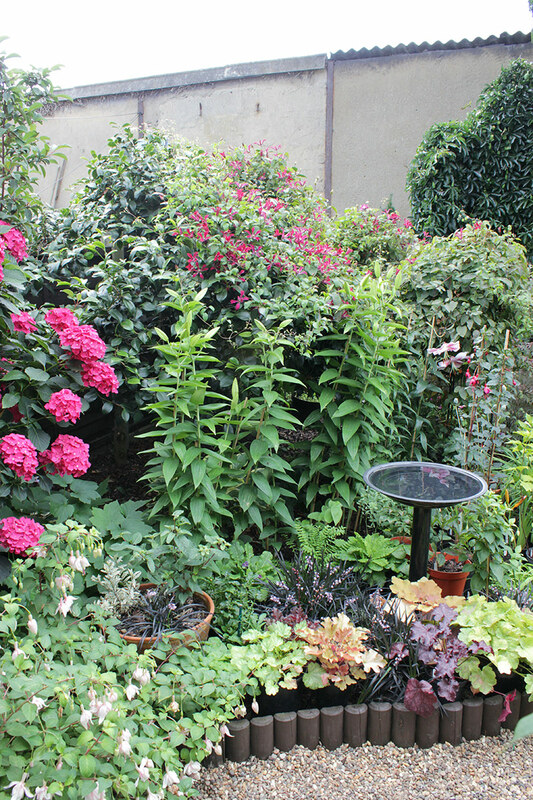 But I love the look of the garden when it is as full as it is now. Wow...your window boxes are absolutely amazing this year and your gardens are lush! You are certainly having a good growing season there Helene...bountiful yes! Thanks Lee, the window boxes are possibly a bit too full…they need watering every single day now, I might have to rethink for next year, but yes, they do look lovely! What an amazing variety of blossoms you have. Visiting your garden is always a special treat. Lovely colours. I love the bed at the bottom of your garden. I'm not so many miles away from you, but the lilies haven't ventured out yet. I guess yours are just a bit more sheltered. A pleasure to visit once again. Thanks Helen, I have many types of lilies, both Asiatic and oriental, and they flower over a period of 4 months (around 150 lilies in total). Some of my lilies are also still weeks away from flowering so it depends on what type and variety you have and how much sun they get. I have most of my lilies in full shade or semi shade where they perform better and last much longer – but that makes them flower a bit later. PS This time I traced the name of my plant, just for you! Look at those Sunflowers, and Dahlias ... and Lilies ... and Roses! And oh my gosh, I love, love your front summer window boxes. What a great combination of plants. Well done! 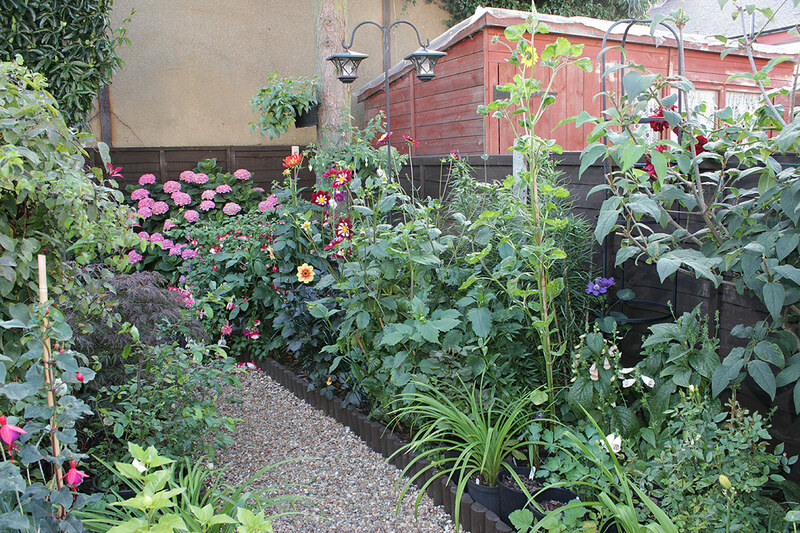 Wow - your garden is stunning...and so tidy! Do you even have a single weed? Everything is impressive... but I'm the biggest fan of the dahlias. Magnificent! Thanks Rebecca, I don’t have much weeds no…I have bark mulch in all the flower beds, and also in many of the larger pots and containers. That suppresses the growth of weeds, and I can spend my time doing more interesting things than weeding. Besides, when you have a garden as full and mature as mine, it doesn’t tend to get much weeds, the plants take over and the weeds can’t really get hold. I really don’t do much weeding! 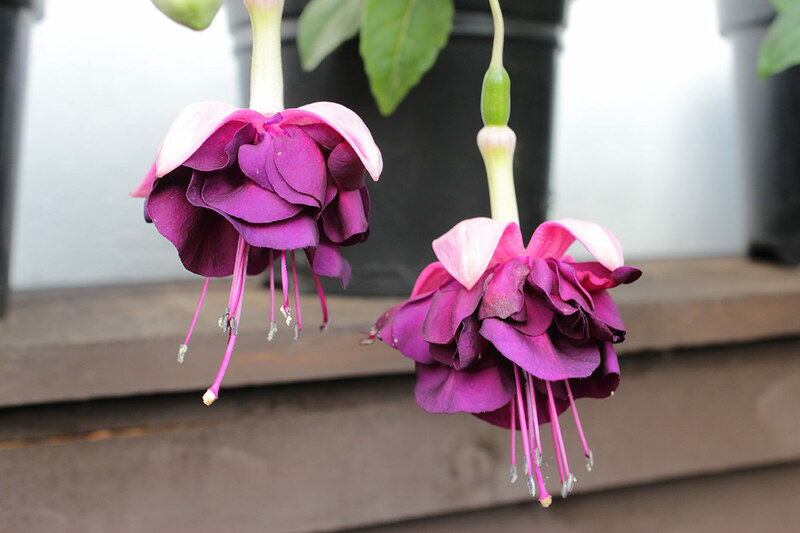 Helene as always I see stunning fuchsias, can't say what variety I love the most! Your dahlias are so high and bloom, your climate is wonderful for them. Mine are starting to flower, and I'm glad because last summer all of them were damaged by snails. Hydrangeas are pretty especially the dark pink one. Happy GBBD! Your garden is really looking spectacular! It is so interesting to see plant combinations blooming in your garden that I would never see together since they bloom at different seasons here. Your fuchsia is gorgeous and I can't get over how big they are! Also love the clematis and sunflowers. I had a surprise giant sunflower show up in my kitchen garden and the bees loved it and now the birds are reaping the benefits. Loved the tour of your summer garden! Wow, and here I grumble about worrying about my 10 containers every day - 200 plus is a lot of pots! Though maybe you get more rain than we do to help out. Your garden looks stunning, stunning, stunning. Your lilies are amazing! And did I see what looked like a 10 foot lily plant full of buds in one of those pictures?! Your window boxes are gorgeous, your vines are gorgeous, your whole garden is simply gorgeous! I wish I lived near you and could visit! Thank you Indie, if you ever come to London, please come for a visit! And yes, I do have a Goliath lily about 9 ft tall, still growing and with some 20 or so buds. There are 4 of them against the fence next to the dark pink hydrangea, the other 3 are a bit shorter, they are called Miss Feya. Thanks Alistair, lots going on here too, with several family visits, so blogging hasn’t really been a priority here either. 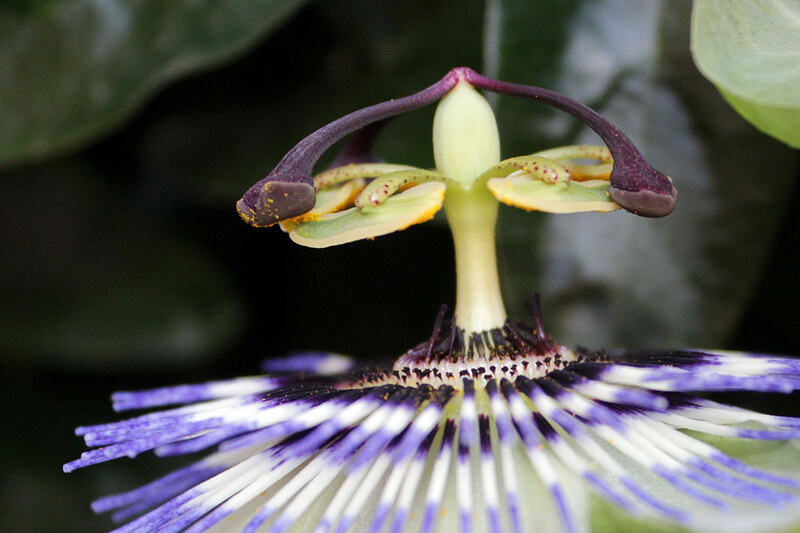 I chose the easiest passionflower to grow when I attempted growing one for the first time, 3 years ago – and the result is what you see hanging on that dead tree stump. I really can’t take much of the credit for it as I didn’t do anything else than provide a space for it, the rest has just happened – literarily! 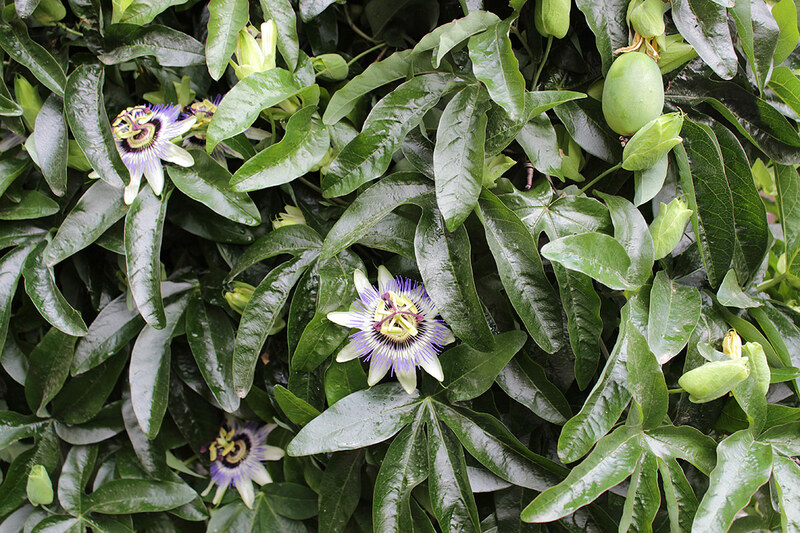 I know some of the other species and cultivars can be trickier to grow, but Passiflora caerulea grows like weed here in London, if you haven’t tried one in Cheshire yet than do, you might find it much easier than in Scotland. I hope you have good summer too. Hi Helene, as always it is a pleasure to visit your garden. The plants look fabulous and so many colours. You did do some cutting down in nursery-the shelves are empty! We have pretty nice weather in B'ham too, so I escape into the garden whenever I can, hence being so behind with blogging. But the snails and slugs also like my garden, and so many plants have been eaten! Anyway, enjoy your day! Thanks Aga, this summer has so far been a repeat of last summer – amazing! We had the hottest day so far this summer today, in my garden it was 34 degrees at 2 pm. I use organic slug pellets in my garden, I have hardly any slugs and snails at all. You just need to keep applying it regularly, especially after it has rained. You have some lovely things in bloom and gorgeous photos. I love the penstemon and you have some really unusual dahlias. Your Niobe imposter looks just like Ville de Lyon but this usually flowers in early summer and then has another go later. Thanks Chloris, I have looked at Ville de Lyon, I agree it looks very similar to mine so maybe that’s what I have. 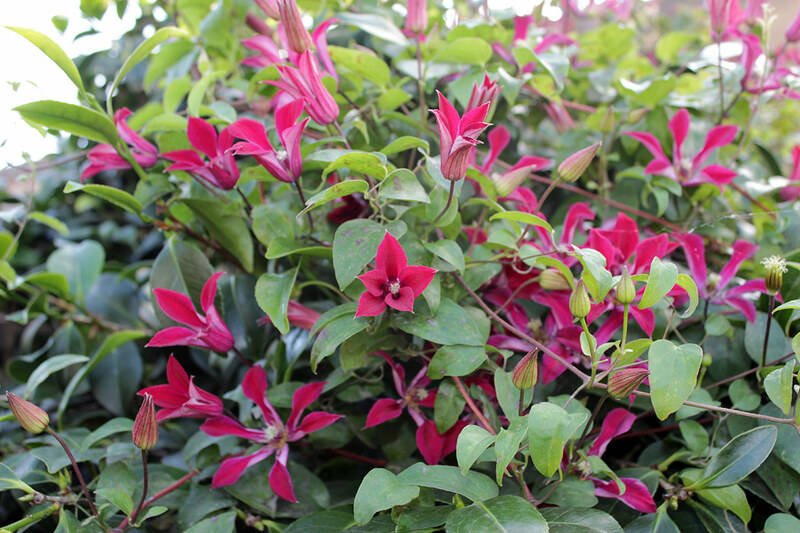 Ville de Lyon is a pruning group 3 clematis and should flower from early spring to late autumn, which mine does. Thanks Ruth – we thought we had that kind of summer last year! And now we seem to have a repeat of it, which is so unusual I can’t tell you, TWO amazing summers in a row, now that’s very rare! I wish us both luck getting rich from our summer flowering hellebores, we might need it!! 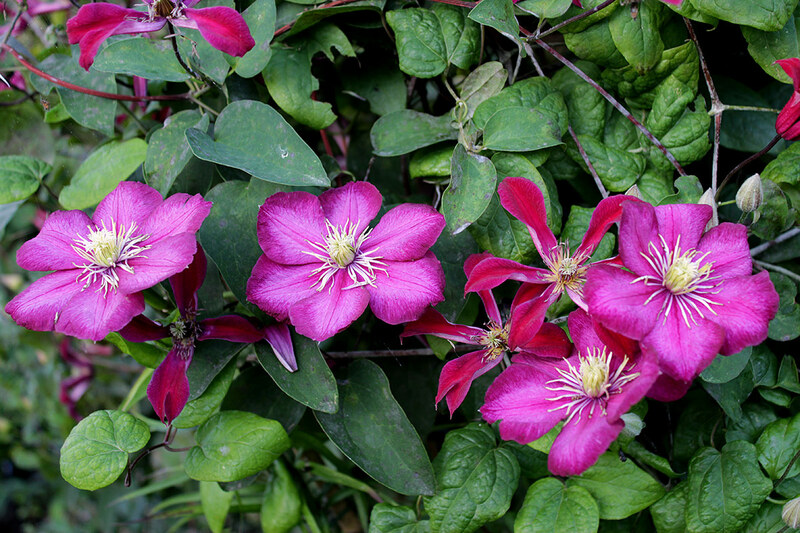 Your clematises are amazing! 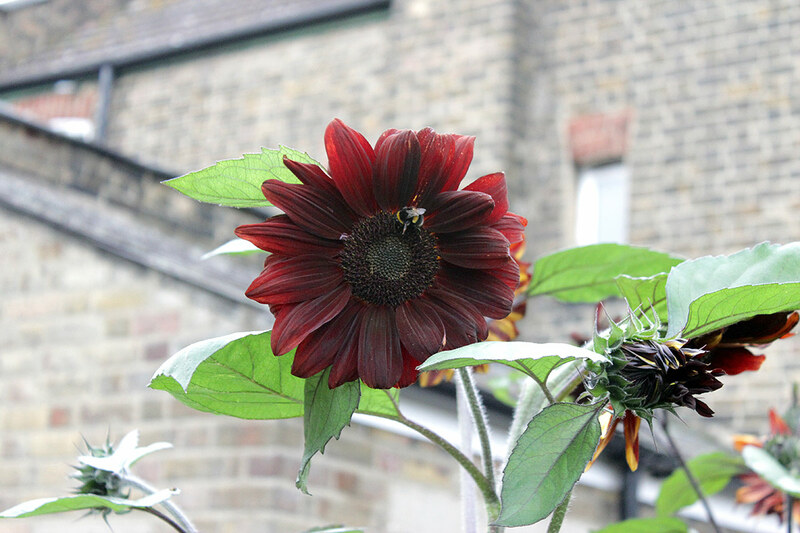 I love the 'Claret' sunflower, too. But I'm still trying to wrap my head around 54 fuschias--I'd be happy to have one that survived here:) I would love to wander around your garden, Helene; so many interesting blooms in every nook and cranny. 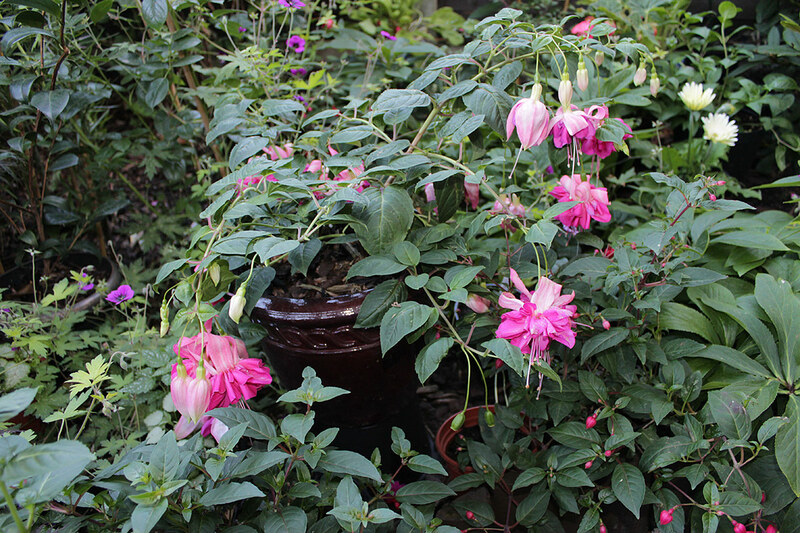 Thanks Rose, I use many of my fuchsias as ‘ploppers’ – I have them in pots and just plop them in wherever there is a gap. They move around all through the year as the gaps tend to be different with the season too! I can’t see why you shouldn’t be able to grow fuchsias, I had them in Norway and treated them as annuals, most fuchsias will grow from tiny cutting to big plant with flowers in one season. In Norway I had winters down to minus 35C and the summers were short with temperatures up to plus 35C. 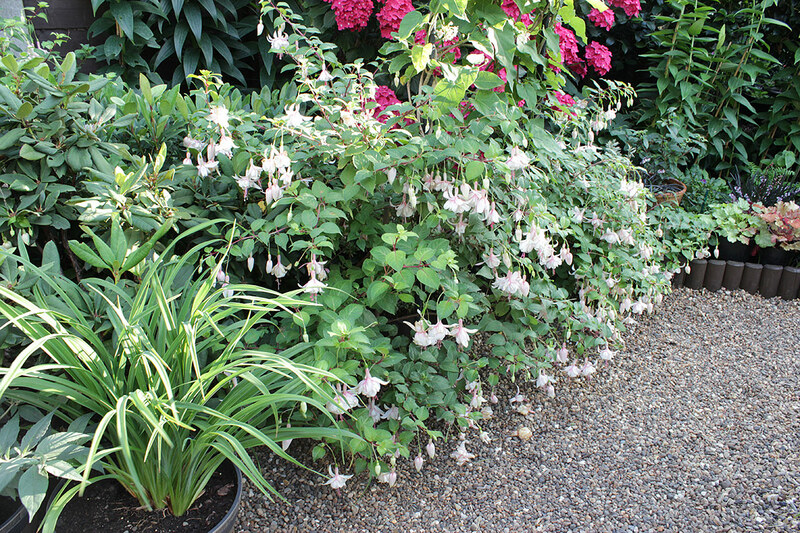 The fuchsias grow best in shade or semi shade so is excellent for those areas where other plants struggle, they don’t get eaten by slugs and snail – and you can eat the berries! Hard to believe we're half way through July already. I am so impressed with your nursery area. You are incredibly organized! and your garden is absolutely overflowing with plants. Gorgeous. have to admit I rather like the burnt orange sunflowers but it's got to be a bit frustrating that you seem to keep getting the wrong seed. I like the orange sunflower too, but just not right there, it kind of clashes with my carefully planned colour scheme! Hi Helene, your garden never ceases to amaze me, what few fuchsias I have, including a couple that overwintered, are only really just coming into flower even though it has been a very mild year. All your plants are looking really healthy and I think you will have more cutting back to do before summer is over! Sorry about the deleted reply as I had left someone else's name when I copied it in! I keep cutting back all the time, the council was here just the other day and picked up 3 sacks of garden waste and I have already filled another bag. As for the healthy bit, yes most of them are good, at least on a bit distance, but my clematises are suffering with fungus as I didn’t keep up with fungus treatment in May and June, it was just too many things to do here. But the new growth coming out looks good and I have done treatment now. So many things to keep track of…. I think your window boxes are wonderful! 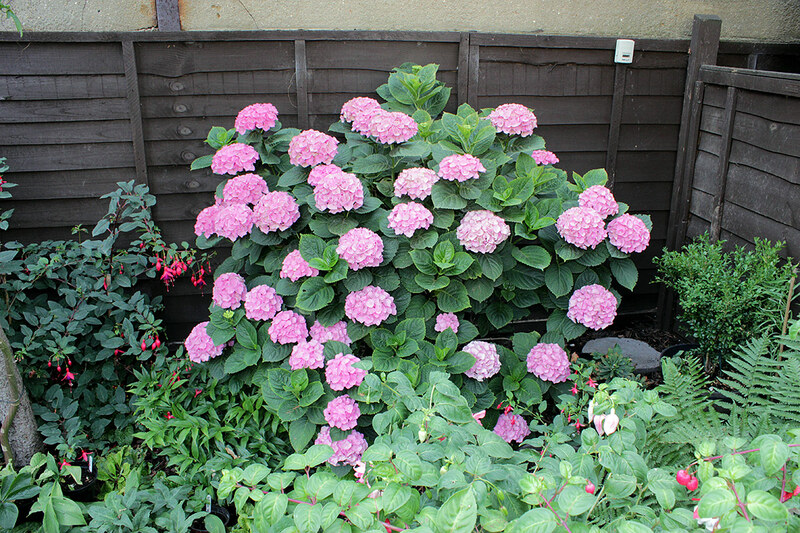 Although that monster Hydrangea is giving you some problems by being floppy - it is striking! My eyes went to it's vibrant blooms in each picture. My hydrangeas (I have 6) are either white or blue. Seeing this makes me want to go get a bright pink. Thanks, and welcome to my blog! The dark pink hydrangea got 8 bamboo stakes yesterday, all 7ft tall, plus some shorter ones at the front. At least I have saved it from an untimely summer pruning like I had to do 2 years ago :-) I have a white ‘Annabelle’ too and a ‘Pinky Winky’ that goes from white to pink. The 2 pink mop heads could be blue in my garden I suppose, but my soil isn’t low enough in pH so that means adding aluminium to the soil and I can’t be bothered with that. If your soil has a very low pH I suppose you need to get a hydrangea that would be sure to stay pink even under such conditions. Jungle it is Helene! All looking wonderrful though. 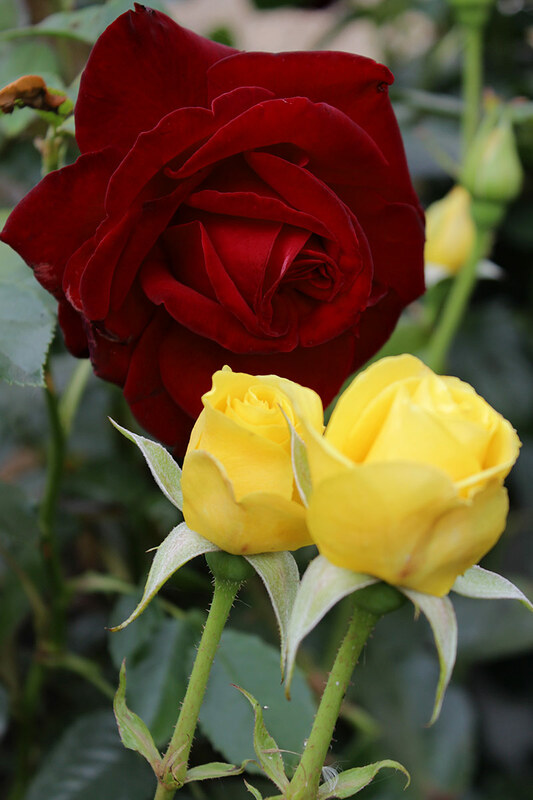 Thank you for showing both your red and yellow rose together. I've been thinking of growing one of your babies on new trellising in the front garden, where it will be paired with a yellow shrub rose and a.n.other that I haven't bought yet. I also want to compare the deep red with the orangey red of the Tropoaleum before I make the final decision. Both cuttings now have buds that are on the verge of flowering so it won't be too long a wait. I think we had a conversation last year re your C. Niobe. Take a look at C. Ville de Lyon. It's identical to mine. I'm always impressed by your front garden and what you've got growing there - this time is no exception - it's beautiful. 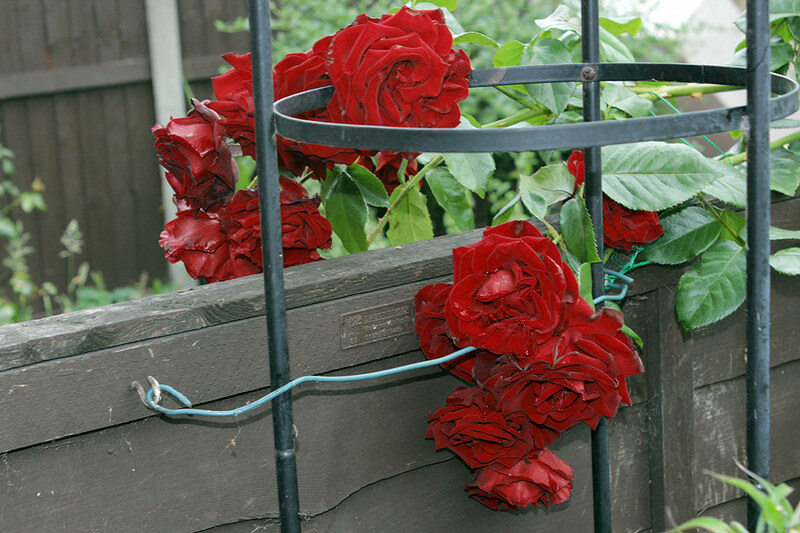 Thanks Angie, I am so happy to hear the ‘Crimson Cascade’ cuttings have buds, what I find in my garden is that these roses go together with most colours, this very deep red colour is rather neutral and I think it is lovely together with everything from white and pink to bright yellow and even orangey red. 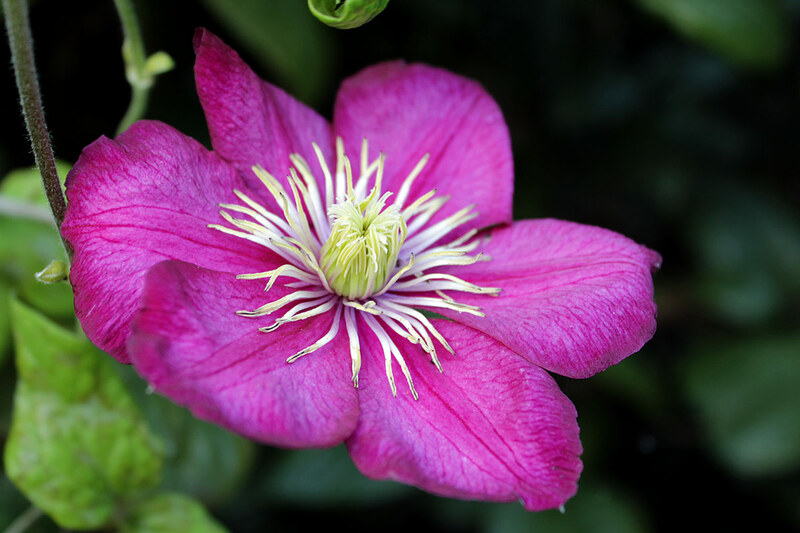 As for the clematis, I think I will officially give it a name change on my blog and on the GPS website, it certainly isn’t a Niobe – although I’d love to have one, if I could manage to squeeze another clematis into my jungle garden! A grand tour of your garden! 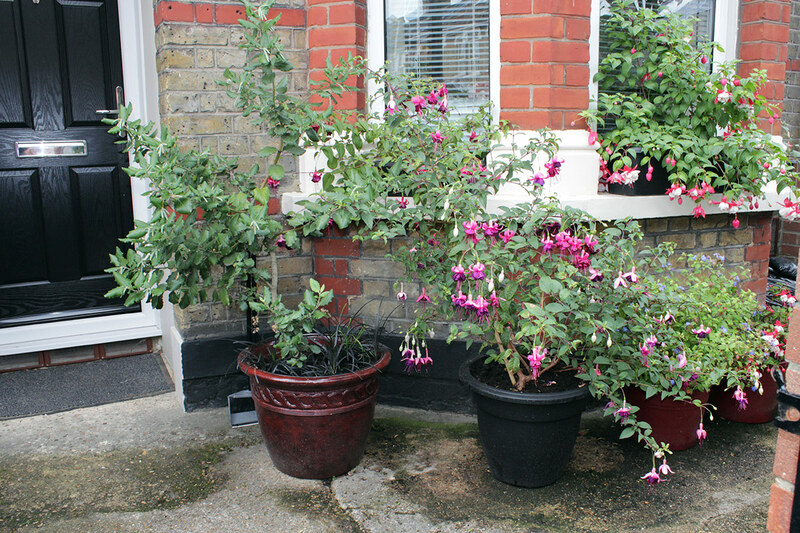 I love everything from your fabulous planters in front to your exuberant clematises to your always wonderful fuchsias. 'Velvet Crush' may be my favorite. Thanks, ‘Velvet Crush’ has turned out to be an excellent fuchsia which in my garden now has flowered for 12 months non-stop! I just love how it changes in colour from bud to fully opened flower. 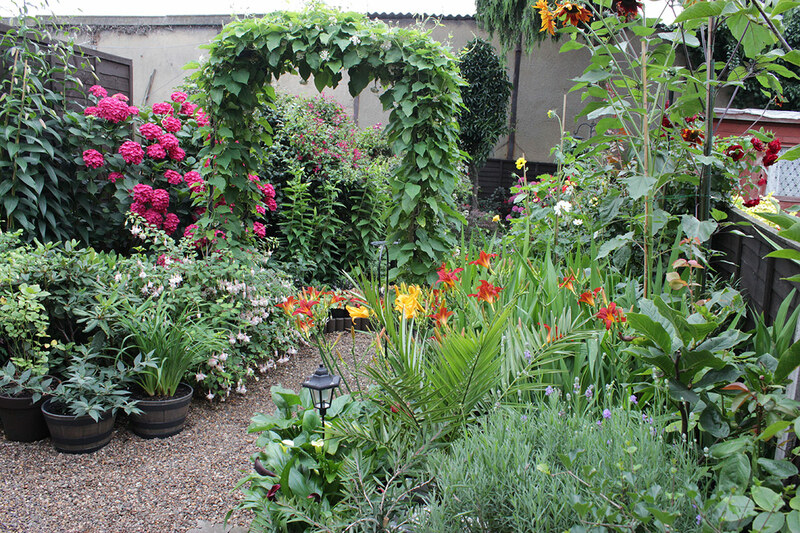 Dear Helene, you have an incredible lovely summer garden! 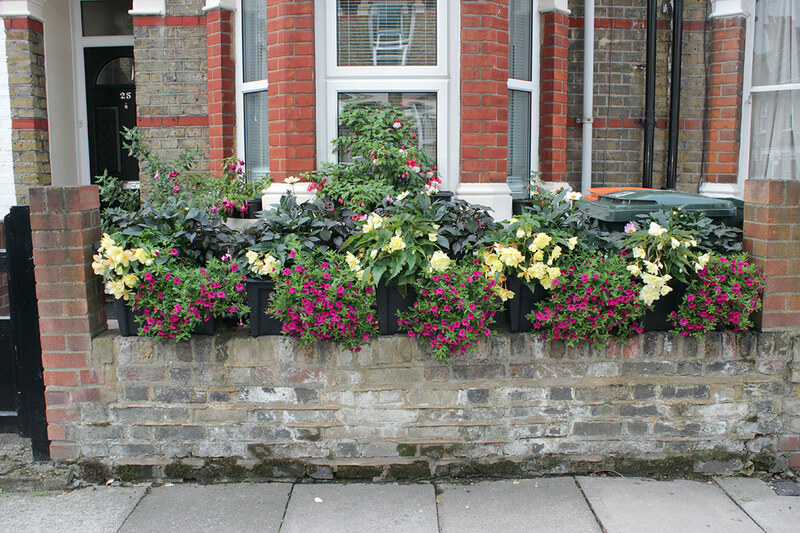 Your window boxes are sooo... beautiful! I hear you about the dahlias, but the foliage alone makes such a striking contrast to the two other plant varieties, even if you can't see the blooms very well. Your oriental lilies are just spectacular and I love, love, love all your dahlias. 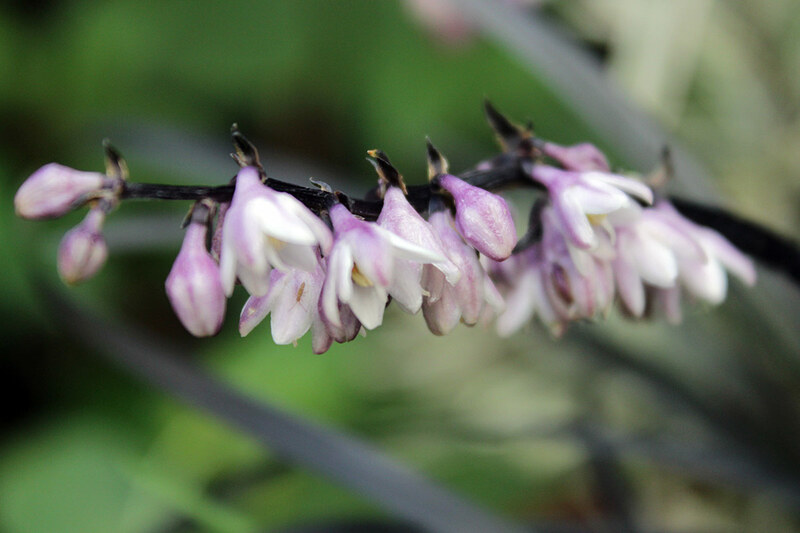 I have never seen black mondo grass flowering and had no idea that the blooms are so pretty! Looking already forward to the next post about your garden! Wishing you a nice week! Thanks Christina, it is a lot of work maintaining the garden right now in the summer heat, but well worth it. My Casablanca lilies started to open yesterday evening, they are enormous, 12 with lots of flowers on each and the smell reach all the way into my kitchen. Helene, you have so much in bloom at the moment, it looks spectacular! I too am unsure about Niobe which I recently planted in my garden. The flowers looked much more crimson on the label, but, as you say, they are still pretty. How you keep the slugs and snails off those beautiful Dhalias I don't know! Hi Paula, I am going to rename my Niobe to C. Ville de Lyon, I have seen photos of it and it looks just like mine. Just another wrongly labelled plant I guess! I use slug pellets, and I pick slugs and snails and throw them in my compost bin whenever I see them. I don’t really have a slug problem on my dahlias, there are other plants that are more eaten than them, perhaps why the dahlias are looking nice! WOW! If you need rescuing from all that lush growth just yell....VERY LOUDLY! Thanks Jane, I am pruning and cutting down weekly, my local council are here every fortnight picking up garden waste for composting – and yet my garden seems to grow like mad. 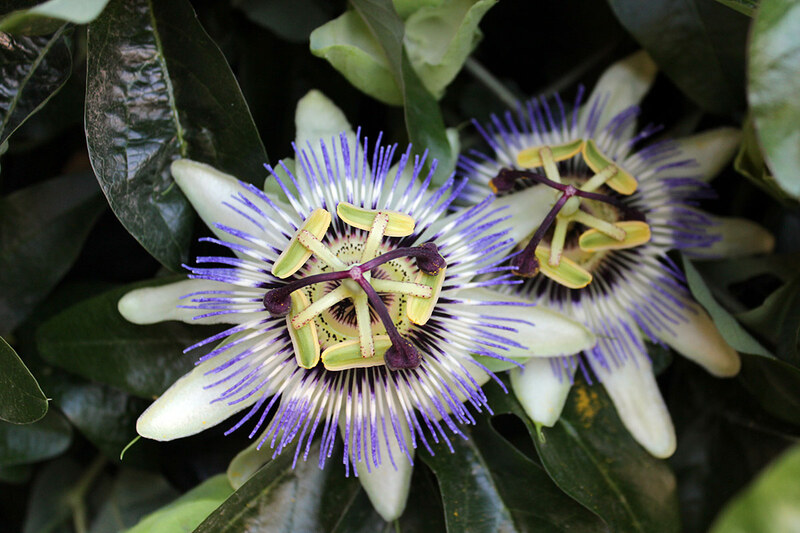 If you got room for a passionflower I can warmly recommend it, but beware, they get huge! Your plants always look so healthy and well cared for Helene. It must take you a long time each day to water 200 pots. Well worth it though. The flowers are the front of the house are so very pretty. 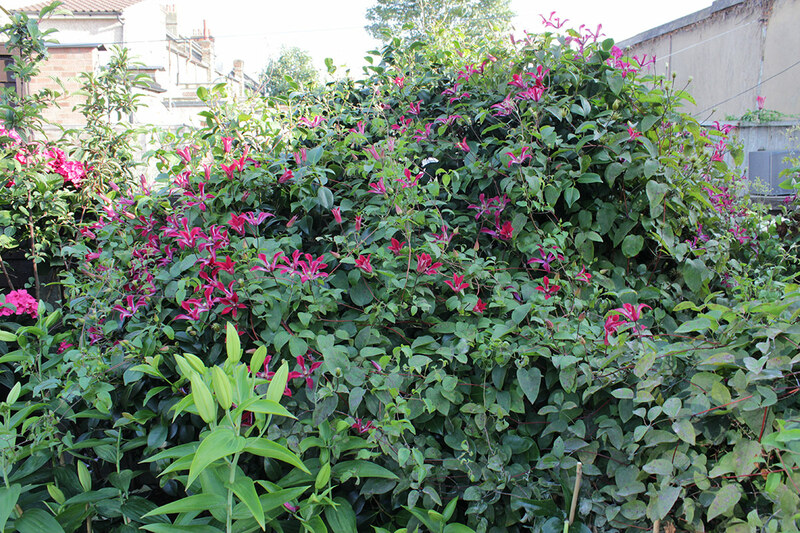 It would be a shame to cut down the fuchsia even if it is blocking some light. What do you do to get your lilies so tall? The dahlias are fantastic too. Love the clematis covering the camellia and the hydrangeas are very, very pretty. A agree, I love looking close into the intricate parts of a flower, they are a little universe of their very known. Hi Connie, and welcome to my blog! I am afraid same principle apply in my garden as in yours, if not for irrigation and watering I would not have many plants or flowers either. I know everyone has this impression that it always rains in England, but that’s not true, at least not on the east side of England where London is. Here in London it rains less than in Sidney, Dubai and in Dallas. My garden is a result of frequent watering 6 months a year and sporadic watering the rest of the year. But it is well worth the work and cost. 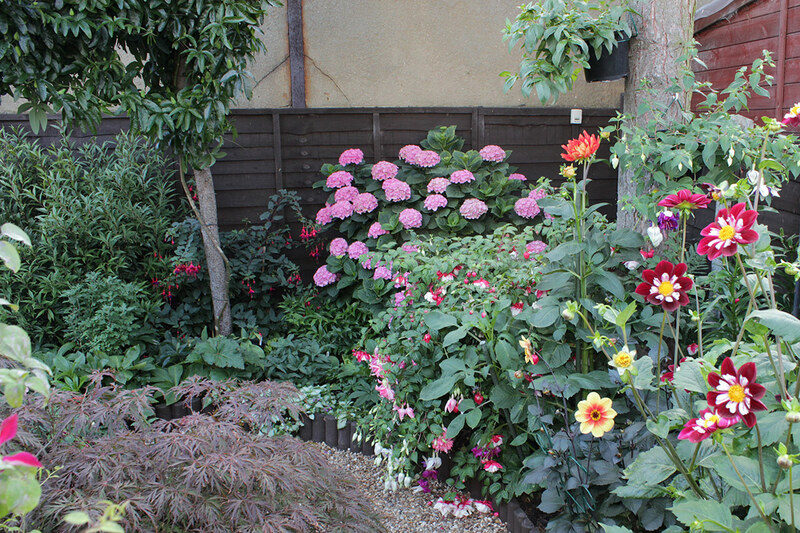 Helene I am just in awe of your mid July garden...I still adore your front wall containers...so incredible...and then when you move in the back I don't know where to begin...everything from dahlias to sunflowers. And 200 plus containers oh my!! Thanks Donna, I am trying to reduce the amount of pots and containers, it has been a struggle to water during the amazing summer weather we have had so far. I have planted some, given away some and sold a few of the plants. Not sure how many I have left, but it’s less than before! The wacky aphids are back! The web-site and blog Graphicality is created and managed by me, Helene U. Taylor. I was born in Norway in 1964 and moved to London, UK in 1999 where I still live. My web-site, see link above, which celebrated 15 years in 2014, is a combination of thousands of photographs of all sorts and graphic design work like greeting cards, logos and web-site projects for friends and family. A new edition of later years is my books, self published through Blurb.com.